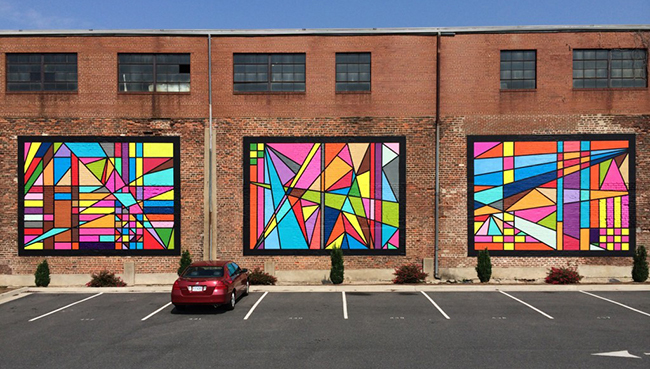 The 90′ x 20′ “Triptych Warehouse Mural Project” was completed in 2014 and is currently featured in the Historic District of Downtown Farmville, VA . Thanks to Longwood President W. Taylor Reveley IV, Grant Avent, & Tim Pierson for bringing more *COLOR* to campus & the Longwood Media staff, Mary Jo Creaney Stockton, Billy Tucker, Matthew McWilliams, Kent Booty and many others for the feature on the Longwood University website. To Marge Swayne and the Farmville Herald for the Cover Story. To Pam Butler of Mainly Clay, Sally Thompson, Jimmy Johnson, Charles Ross, Kerry Davis Mossler, & the entire “Farmville Downtown Partnership”, Cricket & Randy Edmonson for hosting me, Thomas Robinson & the Farmville Presbyterian Church for making this possible. To the Mayor David Whitus, the entire Farmville Town Council & the Town Manager Gerry Spates & his staff for all their help and support throughout the Project. To the people of Farmville for all of the support & to each & every individual involved in so many ways! It was an honor to be back creating in a town that I care so much about!